We had previously discussed Webizen, a proposed program to increase developer representation within W3C for a modest fee. Instead we have now dropped the fee, introduced a gratitude program, Friends, and focused on how W3C gives Web developers a greater voice, and which services they value in particular. Our free validators provide the Web a fair, reliable help in building Web content that works now and will work in the future. 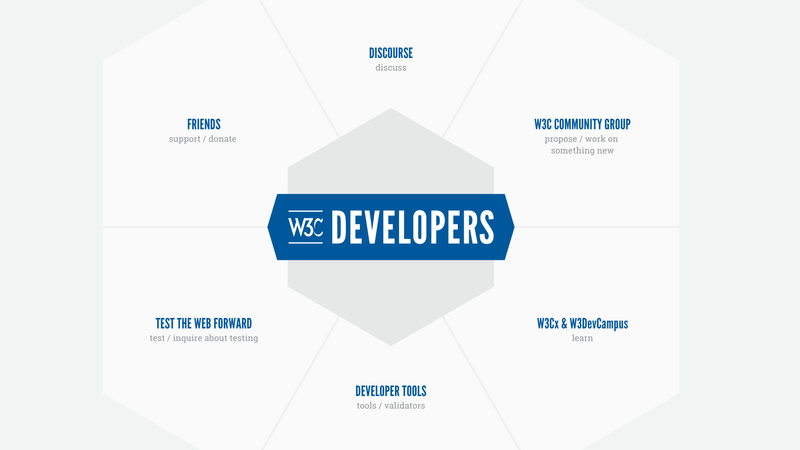 More than six thousand people have embraced W3C Community Groups since launch in 2011 and a considerable amount of incubated work transitioned to the W3C REC track. We are successfully teaching several thousands of Web developers via our free and premium Training program. Our strong commitment to those who make the Web work feeds the virtuous circle of increasing developer engagement at W3C and the value of W3C to the community. We are making it easy for you to affiliate as Friends, take advantage of our offerings, and we encourage you to donate to support us in conducting the activities that fulfill the W3C’s mission. I am looking forward for this. Might be very useful! Thank you. Well is been a decade trying to learn; is beautiful that people made things do toward and with out see faces and colors. You are great people and with brilliant talent I will be looking always toward to meet you and I know I own a lot to all the web developers. One think I don’t see any problems with (form.BackColor=vbRed). It’s Useful Information. thanks A Lot For This Kind Info.